First here is RSS TTT with the latest dataset, version 4. TTT seems to measure more of the troposphere than TLT (that is, it has a greater vertical profile) with less of the stratosphere than the mid-troposphere data (TMT). 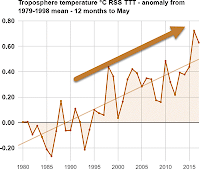 It shows a higher rate of warming than RSS v3.3 and higher than UAH. Hover the cursor (arrow) over the plots to see the data points, trend etc. The chart below is the average of the 12 months to May each year from 1979 through to 2017. The annual averaged anomaly was 0.63 °C, which is 0.09 °C lower than the previous hottest 12 month June-May period that ended in May 2016. The rate of warming is 0.18 °C/decade or 1.8 °C/century. TTT = 1.1*TMT - 0.1*TLS. This combination reduces the influence of the lower stratosphere, which is cooling at most locations. TLT gives most weight to the temperatures closer to the surface. TTT gives more weight to the troposphere and less to the stratosphere than TMT does, but not as much to the lowest levels of the troposphere as TLT does. However TTT has version 4, while TLT is still only provided as version 3.3. For a fuller explanation see the RSS website or the July 16 report here. Below is the TTT chart just for the month of May. The anomaly for May was 0.608 °C, which is 0.133 °C cooler than May 1998. The rate of warming just for the month of May is 0.16 °C/decade. The rest of the charts are from UAH v6. This is almost identical to the old version of RSS, which is v3.3, so I don't regard it as being as good as RSS TTT v4. The chart below is the average for each 12 month period ending in May each year (1979 to 2017). The 12 months to May 2017 is 0.35 °C, which is the second hottest June-May period on record, 0.11 °C lower than the 12 months ending in May 2016. Below is the UAH chart for the month of May only for each year going back to 1979. The anomaly was 0.45 °C above the 1981-2010 mean, which was the third warmest May in the record, and 0.19 °C cooler than the hottest May in 1998. Has UAH ever published its code and algorithms for open peer and public review? I think pretty much everyone else has, right? Correct me if I'm wrong. They've published, jgnfld - not in a top journal. I don't know if anyone's analysed or critiqued it. Link to his article. Link to the paper. For completeness, here's the link to the RSS paper re version 4 - and to the HW article about it. I meant the actual, implemented source code, not a description. That said, I am on my boat tonight in Newfoundland and the cold, raw north winds off the ice pack to the north continue like they have for weeks. Just about froze on a short sail today. There's icebergs in the area as well. Global warming indeed! Good heavens, jgnfld! I always feel we're pushing the season to be on our boat in northern Lake Michigan at this time of year. I deeply admire your fortitude. A CS-27 is a very solid boat. Tomorrow looks to be just warm enough--frost tonight but high 40s maybe even lo 50s on the water during the day with light NE winds instead of strong N. May have to motor but I need to break in my new Betamarine 14 a bit more anyway. NE is usually considered baddish this time of year--cool and possible rain--but not compared to the due N pattern that has been very constant this year. Back to the subject, Don't you just love WUWT "accidentally" failing to post UAH this month?! I don't think anything shows off the strange thought processes of conspiracy thinking better than letting that go by without comment. For what it's worth, Central England temps Mar-May 2017 were the warmest 'spring' temps in the CET record, which starts in 1659. Fake sceptic blogger and WUWT associate Paul Homewood made a song and dance about CET spring 2013 temperatures, which were the 29th coldest in that record. To date, not a mention has Paul Homewood made of this latest record breaking warmest CET spring in 2017. In fake sceptic land the 29th coolest spring on record is heralded from the mountaintops; a short 4 years later the warmest spring on record in the same temperature series is studiously ignored. It's all very simple really, they pander to their audience of confirmation biased followers. WUWT currently playing a similar game with the UAH update. Their beloved UAH satellite data set publishes a big month-on-month global temperature increase at the same moment in which Trump heralds the US exit from the Paris Agreement. How do the fakes respond? By 'hiding the incline', of course! As they did during the peak months of last year's El Nino, WUWT simply didn't publish their normal monthly temperature update from Dr Roy. It's as if it never happened. They will either publish it once the 'good' news of the US Paris exit subsides or they won't publish it at all. Check out the so-called 'reference pages'. UAH hasn't been updated for months; not since the red line (running 13 month average) topped its previous record level set in 1998. 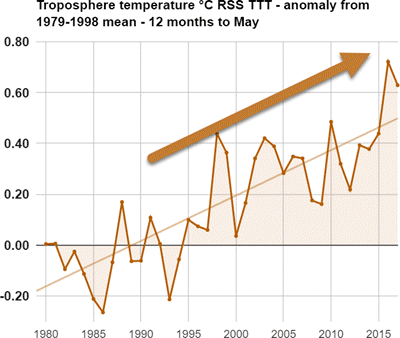 And this is the temperature data set they normally publish as a monthly update in the main blog! If the readers of that site don't see they are being scammed then they are rather to be pitied than scorned. Of course. WUWT avoids publishing anything that goes against their narrative. I suspect a lot of WUWT readers and the anti-science crowd in general KNOW they are being lied to but do not care - this is an explanation for why they are so resistant to reason. I discovered a while back that religious people tend to be the same, they know their holy books are fairy tales but they go on believing because it suits them.